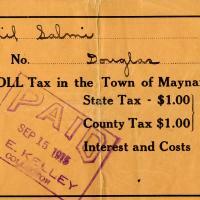 Thirty-One Maynard Poll Tax bills for Emil Salmi, ranging from $2 to $5. Paper, 3.5 x 7 in., 31 copies. “Poll Taxes for Emil Salmi - 1915-1949,” Maynard Historical Society Archives, accessed April 24, 2019, http://collection.maynardhistory.org/items/show/6274.